Cosmetic Dentistry has been one of the centerpieces for most dental practices. And now that teeth are able to look much better aesthetically, it is time to consider the perioral areas around the smile. Feel 10 years younger with facial aesthetics. The skin is the largest organ we have and most visible. The skin can be affected by age and a variety of aliments. Facial skin is the part of your skin that is most looked at by others. 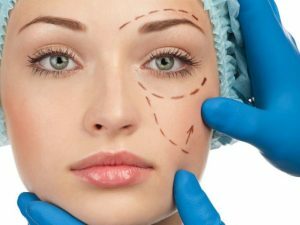 For this reason, most facial rejuvenation and aesthetic treatments are anti-aging. 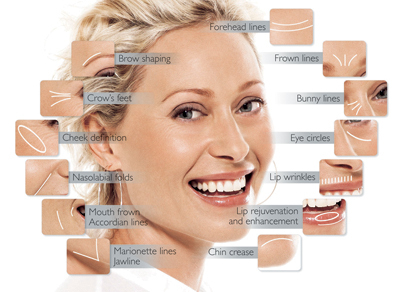 Facial aesthetics is any treatment that can enhance the look of your facial skin. It is a non surgical way of reducing the signs of aging. A more natural youthful appearance can be achieved with a choice of enhancement treatments carried out by a fully qualified member of our team. Most Facial treatments are either carried out superficially on the skins surface or via injections with fine needles. A clinician will need to assess your skin to determine whether the muscles are causing the skin lines to form or whether the skin has its collagen and elasticity. Wrinkle reduction, also known as Botox is a natural substance which relaxes muscles and reduces the appearance of wrinkles from underneath the surface of the skin. The treatment is used as a prevention and to reduce lines and wrinkles which appear as frown lines between the eyes, forehead and crows feet. Although the results can be dramatic with the treatment, it will not radically change your facial appearance. The muscles are simply relaxed, so you can still frown, smile or look surprised without the wrinkles and creases between your brows. Dermal Fillers (in the form of Teosyal®), offer a safe and natural cosmetic treatment that restores volume and fullness to refresh and revitalise your looks. Ideal for deeper lines and wrinkles, dermal fillers work at a deep dermal lever to delay the signs of aging by filling out and smoothing away wrinkles in troublesome areas that include nose to mouth grooves, forehead lines, frown, lipstick lines and crows feet. 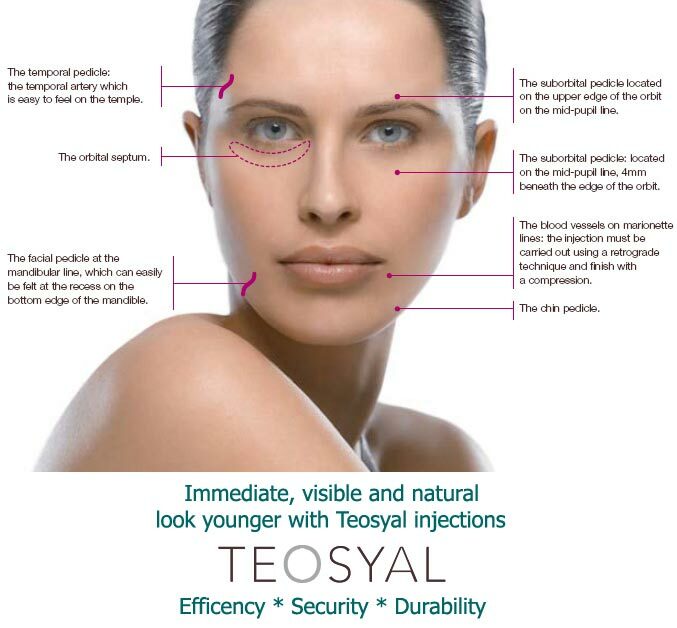 Teosyal® is a full range of injectable dermal fillers made of non-animal origin and biodegradable hyaluronic acid. Why Should facial aesthetics be done by your dentist? Dental Clinics are already CQC registered meaning the clinical environment is suitably equipped to perform non surgical facial aesthetic procedures. Dentist tend to have highly accurate manual dexterity, and are extremely familiar with administering appropriate fine needle injections. Dentist undergo extensive training in the anatomy, biochemistry and physiology of the head and neck in undergraduate dental training, which is crucial knowledge for administering any botulinum toxin and dermal filler products. Dentist are knowledgeable in the management of adverse events such as pain, sensitivity, swelling and infection and can ensure patients of any treatment risks, complications and realistic expectations of the results. A brand new, state of the art- mixed NHS and cosmetic- Dental practice. © 2018 City Quay Dental Clinic. All Rights Reserved.